2. Place the chicken steaks on a baking tray and bake for 25-28 minutes until cooked through with no pink meat and juices run clear. Slice each chicken steak into 4. 3. Toast the pittas and cut open. 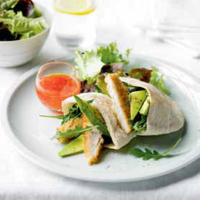 Fill with rocket and avocado then top with the sliced chicken. Drizzle over the chilli sauce and serve with mixed salad.